Hi everyone! I’m really excited to be releasing some new Classic Literature Unit Studies for you all! My kids have been absolutely loving these this year and we’re taking a break from our regular reading to dive into some of these fun classics! For this unit I am using the Classic Starts 20,000 Leagues Under the Sea version. 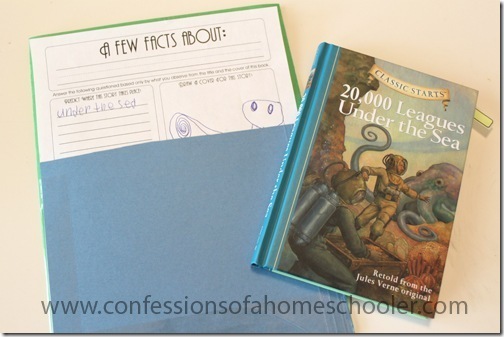 I find the Classic Starts a little easier for younger readers, but you could certainly use this unit with the original version if you have an older student. The assignments are written to go with the Classic Starts edition, but the concepts are the same, so you should be able to complete the lapbook using any version you choose. 20,000 Leagues Under the Sea is an underwater fantasy adventure that is exciting as it is unusual! The story follows Professor Aronnax and his men who are setting sail in search of a “monstrous sea creature” that has been sighted somewhere in the Atlantic Ocean. Instead of finding his monstrous sea creature, the Professor runs into the mysterious Captain Nemo and his futuristic submarine, The Nautilus. 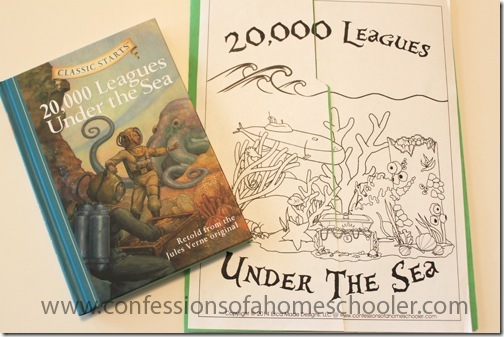 20,000 Leagues Under the Sea is a suspenseful journey of danger and discovery, sure to please all readers! 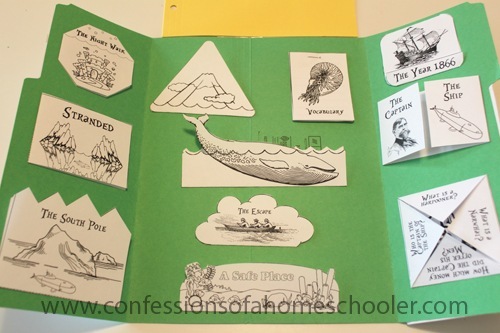 I normally recommend these literature units for elementary level readers. You can assign them out individually to your student so they read on their own, then complete the mini-book assignment for each chapter. Or you can read it together as a group if you have younger readers, then have them complete the mini-book assignments when you’re done with each chapter. 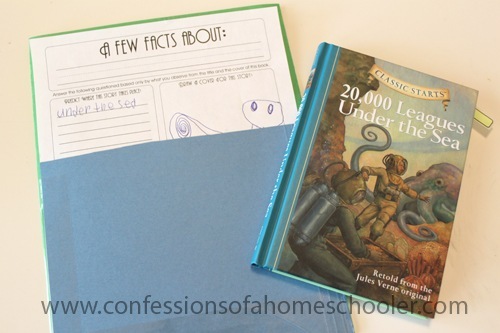 Each unit includes everything you need to complete the 20,000 Leagues Under the Sea lapbook with the exception of the book itself and the file folders. Included is a teacher’s manual with the mini-book questions and answers. This makes it much easier for you to help your students even if you haven’t read the book yourself. There is also one mini-book for each chapter in the book. Inside your student will answer a comprehension question that relates directly to the chapter they’ve just read. 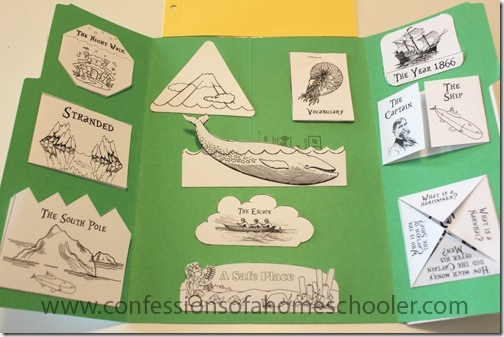 Some assignments include vocabulary words, mapping the voyage, and completing the mini-reports. If you’re doing this unit with younger readers you might want to skip these pages, but it’s totally up to you. 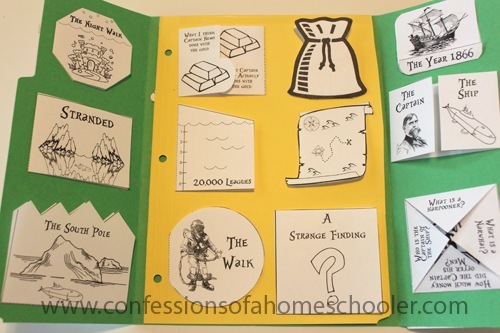 This unit has 20 mini-books including a vocabulary mini-book full of terms to learn thoroughout the story. 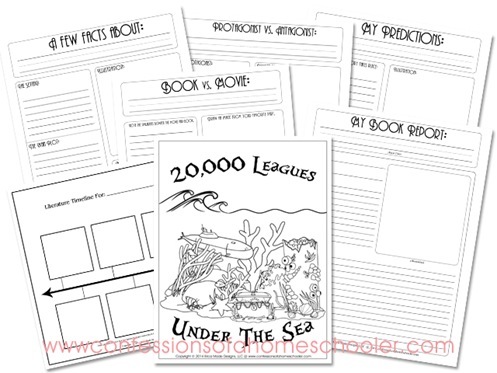 Famous Composers Lapbook & Unit StudyAnd yes, I will be creating another mega pack for these new Classic Literature releases once they’re all done! I’m curious what age you feel these work best for? My girls are the same ages as your kids and just wondering if all of them use it or just your older two? Thanks! Last year we did them as a group, but this year I’ve assigned them out to my older kids to read on their own. So really you can do them whichever way works best for your family. I’m planning on purchasing your Literature Unit bundle as part of our Language Arts for the next school year. Do you recommend using the Classic Starts for any of the other titles? Thank you for all of your hard work! I appreciate you making these available for our kiddos! Yes we really like the Classic Starts for elementary level readers. Good to have reads that boys will like. Thank you for creating and sharing these!!! We read this book as part of an ocean study right before we went on vacation to the beach! I wish we would have had this unit study!! We just finished your Charlotte’s Web study, and we loved it. This will appeal even more to my boys! I just wanted to say thank you for this wonderful Lapbook unit study. I’m using it with my son and another student I tutor… we are all really enjoying it… the Classic Starts are beautifully written and I can see how much hard work you have put into creating this resource. A million thank you’s. I can’t wait to start on the Treasure Island one next.